Since​ ​2011​, ​KBSonline​ ​has​ ​facilitated​ ​a​ ​series​ ​of​ ​computer​ ​classes​ ​for​ ​those​ ​a​ ​little​ ​frightened​ ​or bewildered​ ​by​ ​modern​ ​technology.​ Many​ ​have​ ​felt​ ​separated​ ​from​ ​their​ ​younger​ ​friends​ ​and relations​ ​and​ ​complained​ ​of​ ​being​ ​‘out​ ​of​ ​the​ ​loop’. The​ ​first​ ​two​ ​years’​ ​sessions​ ​were​ ​hosted​ ​in​ ​John Blandy​ ​School​ ​because​ ​of​ ​their​ ​profusion​ ​of laptops.​ ​Getting​ ​the​ ​assembled​ ​company​ ​out​ ​of the​ ​little​ ​people’s​ ​chairs​ ​after​ ​2​ ​hours​ ​was​ ​a challenge​ ​and,​ ​as​ ​members​ ​acquired​ ​their​ ​own laptops​ ​and​ ​tablets,​ ​we​ ​changed​ ​the​ ​format and​ ​the​ ​venue. We​ ​now​ ​meet​ ​in​ ​the​ ​Village​ ​Hall​ ​soon​ ​after Christmas​ ​each​ ​year.​ ​​ ​For​ ​the​ ​past​ ​two​ ​years instead​ ​of​ ​‘teaching’​ ​computer​ ​skills​ ​we​ ​have​ ​established​ ​clinic​ ​format​ ​where​ ​anyone​ ​can​ ​come with​ ​their​ ​individual​ ​problems​ ​and​ ​get​ ​advice.​ These​ ​problems​ ​have​ ​ranged​ ​from​ ​safe​ ​banking and​ ​selling​ ​on​ ​the​ ​Internet​ ​to​ ​disaster​ ​recovery​ ​following​ ​the​ ​loss​ ​of​ ​passwords.​ We’ve​ ​not​ ​been stumped​ ​yet! Look​ ​out​ ​for​ ​announcements​ ​about​ ​the​ ​2018 ​series. Links for the Computer Group. Use these links to help keep up your interest and recall things you have been taught in the Computer Group. Netiquette ~ respect other peoples views and be polite. Wish to know what to do next or problems with your computer ? 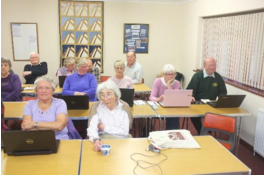 Click on the link Martha's Web and view what my friend Martha says: 'I am still learning and I am proof that you never get too old to learn. I hope that you will find the answers you are looking for on my site, I made it for all of my friends that are computer newbies (and confused) and I hope you will use the information provided here to keep your computer running smooth as new, to become better informed about scams and be safe while surfing'! The links shown below are some that we use most frequently, and some that I recommend that you try if you are new to Family History. The Federation of Family History Societies [FFHS] has details on how to begin your Family History. There are a loads of questions and answers on this Federation website. Also on the same site you will find "Tips for using a Record Office". The web is now so full of genealogy sites, that it can often be a daunting experience to determine what to do next to discover the past lives of our ancestors. I have arranged these links below in an order which I hope will help you if you are researching your family history or if you are simply browsing these pages and wish to journey via photography to Wales, Derbyshire, Oxfordshire and Berkshire. National Statistics Birth Marriage Death Official information on births, marriages and deaths. Ancestry.co.uk - all England and Wales Census - one of the best things to happen in family history research. Family Search (IGI) and much more. This an LDS Site which is free. Not everything is covered but what is often has a link to FindmyPast. FindmyPast - Bring your past to life by tracing your ancestors and building your family tree. Free BMD - Free search of the General Register Office Indexes - not yet fully complete. Need volunteers. The War Graves Photographic Project, are a group of dedicated volunteers who have undertaken the immense task of recording, archiving and making available to the descendants, images of the graves or memorial listings of every service casualty since the outbreak of the First World War. So far they have been able to photograph and record over 1.6 million named graves and memorials. To learn more about the project, search the online database or request a photograph please visit www.twgpp.org . The Parish Chest ~ online Family History Fair An Aladdin's Cave bursting with parish registers, family trees, census records, directories, etc. What day was it on ...? To find out what the day of the week was or will be on a given date. Leftover 1901 census - a Rootsweb Chat room regarding leftover census. Heritage Search at Oxfordshire Libraries. The National Archives [ TNA ] for:-Census Returns, Divorce Records, Wills, Death Duty Registers, Nonconformist Register details. Wills at The National Archives. National Library of Wales free online Wills, Newspapers and Marriage Bonds. The British Library Newspaper Library - excellent for background history of a person or place. Oxfordshire History Centre - A centre of excellence for study of Oxfordshire. West Glamorgan Archives - Safeguarding the archival heritage of West Glamorgan. Archives Wales - a single search obtains information about more than 7,000 collections of historical records in the holdings of 21 archives in Wales. Llanciach Fawr Museum - an excellent 'living' museum which should not be missed. A Vision of Britain through Time A vision of Britain between 1801 and 2001. Includes maps, statistical trends and historical descriptions. Bing Maps - online maps to everywhere. Google Maps - excellent maps and street views of mostly everywhere. Locating Archives [a2a] - TNA - location of archives around Gt Britain. Gareth Hicks' helpful Welsh websites Lots of very useful information here. Rootsweb Mailing Lists listing all RW Mailing Lists worldwide and on many subjects. John Ball's Welsh Archive Listen and learn Welsh place names and see superb photographs. Welsh Folk Museum - a wonderful museum, more than a day's visit. Llanciach Fawr Museum - Llancaiach Fawr Manor stands proudly, as it has done since c1550, overlooking the Glamorgan Uplands. Step inside the Manor House restored and furnished as it would have been in 1645. All the furnishings in the rooms are accurate reproductions of items from the time of the Prichards. Well worth a visit. Good resturant. Geograph ~ Search for any photo of the British Isles - and see if it is covered. Some spectacular images. Headington History - some great photos of Oxford. Faringdon online - take the tour! Village Site ~ Kingston Bagpuize - A Village Snapshot. A sister site to Muir Family Genealogy. Village Community Site ~ Kingston Bagpuize Online. Alan Jefferies website ~ history of Jeffries ancestors who lived in Kingston Bagpuize, much newspaper information on this site re this village. Genealogy web design - Pat's truly helpful website for building genealogy and other webpages. Rootsweb Freepages unlimited webspace for free. You will be automatically subscribed to Freehelp Mailing List.The list purpose is for Family and Local history and no adverts. Rootsweb World Connect - submit your family tree to World connect. More than 460 million names on file.